In addition to my old company Fiserv being selected as one of the nine worst places to work in the US (and trust me, they didn't just win that title overnight, they worked at it for years) another reason I don't miss schlepping to Jersey City is because of the charming statue of a soldier getting bayonetted in the back, as seen in this photo. The inscription on the statue's pedestal is Katyn 1940. I doubt if one in a thousand people passing by has any idea what Katyn 1940 means, and very few of those who don't know have bothered to look it up. The photo editor who used this image for a booster article about Jersey City real estate either doesn't register the violence of the image, or maybe is getting in a subtle dig at Jersey City. ...was a mass execution of Polish nationals carried out by the People's Commissariat for Internal Affairs (NKVD), the Soviet secret police, in April and May 1940. The massacre was prompted by Lavrentiy Beria's proposal to execute all members of the Polish Officer Corps, dated 5 March 1940. This official document was approved and signed by the Soviet Politburo, including its leader, Joseph Stalin. The number of victims is estimated at about 22,000, with 21,768 being a lower limit. The victims were murdered in the Katyn Forest in Russia, the Kalinin and Kharkiv prisons and elsewhere. Of the total killed, about 8,000 were officers taken prisoner during the 1939 Soviet invasion of Poland, another 6,000 were police officers, with the rest being Polish intelligentsia arrested for allegedly being "intelligence agents, gendarmes, landowners, saboteurs, factory owners, lawyers, officials and priests". Which is horrible, of course. But considering how many genocidal massacres have occurred since 1940, including, just off the top of my head, 6 million Jews in the Holocaust, a million Cambodians in the Killing Fields of the Khmer Rouge in the 1970s and up to a million people in the Rwandan Genocide of the 1990s I have to wonder what reason there is to plop this image of horrific violence right in the middle of a busy office plaza. On the one hand you could argue that the statue might give you a sense of perspective, since the tribulations of an office job are nothing compared to the various world's atrocities, but still, it's not a happy thing to look at on your way to work - and eventually you stop noticing it entirely. The article is about how New Yorkers have discovered Jersey City, real estate-wise because housing is so much cheaper in Jersey City. 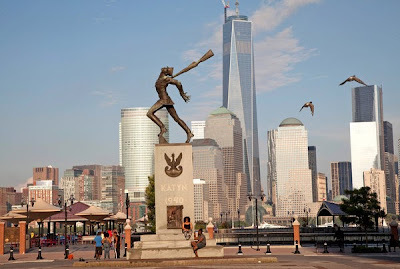 Maybe in some parts of Jersey City, but in the Paulus Hook section, the neighborhood closest to the plaza shown in the photo, what surprised me most when I briefly considered moving there to be closer to work was how expensive apartments were - not all that much less than apartments in New York. So not worth it.